Chincoteague horses comernfrom the Eastern coast of the United States, the islands of Chincoteague andrnAssateague off the coast of Virginia and Maryland. They are well known forrntheir hardiness and willing to succeed. Additionally, they are raised forrnriding and harness work (they are good at carry burden long distances). It's not clear how thernChincoteague horses evolved, but most believe that they are related to 17rnArabian horses that swam ashore from a spanish vessel that had capsized off therncoast, around 1600. Once on the islands they became stunted under the harshrnenvironment. To keep from starving they ate coarse salt marsh cordgrass,rnAmerican beachgrass, thorny greenbrier stems, bayberry twigs, seaweed and evenrnpoison ivy. Because they drink salt water, they have an appearance of being fatrnor bloated. At one point the horsesrnwere split into two different groups or herds. The two groups are The MarylandrnHerd and The Virginia Herd. 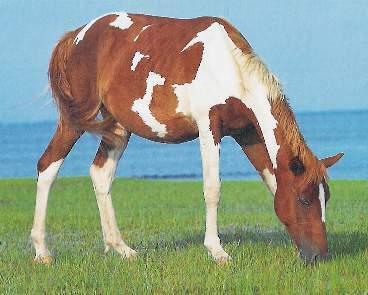 The Virginia Herd consists of approximately 130rnhorses and are owned by the Chincoteague Volunteer Fire Dept. The ponies grazernin the Chincoteague National Wildlife Refuge, located on the Virginia portionrnof Assateague Island. The Maryland Herd consists of approximately 140 Head andrnis owned by the Maryland Park Service. Every year, in July, theyrnare are collected and taken across the water to be included in a large group ofrnall of the Chincoteague breeds that are put on display for all the residents tornview and many are auctioned off. The Chincoteague horse isrnsweet and calm. They are also considered kind and very wise. This cool andrncollective temperament of theirs is why they are such an excellent choice forrnriding and especially with little ones as they are not very tall and can berneasily manipulated when riding. They are an extremely resilient and have thernremarkable ability to continue on for weeks without any supplies. They grow to around twelvernhands high. They can be bred in all sorts of colors and are considered anrnattractive animal. They have beautiful heads and a short back, along with arnvery thick mane and tail alike. They have a stocky build and are great forrnriding. Theyrnare extremely simple to tend to as they can spend most of their lives roamingrnaround without any help from their owners. They have the keen ability to obtainrnall of their needs and supplies on their own, for the most part. Additionally,rnthey can reside in very warm areas, as well as very cold climates.